Consultants in Asthma, Allergy, & Immunology (Garfield) - Book Appointment Online! Our primary mission is to provide state of the art medical care to patients of all ages suffering from allergies, asthma, and diseases of the immune system. The center is staffed by Drs. 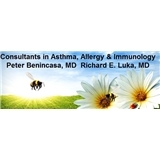 Peter Benincasa and Richard E. Luka both board certified specialists in adult and pediatric allergy and immunology. We focus in the diagnosis and treatment of allergic diseases involving the upper and lower airways, the eyes, the skin and the GI tract. Conditions that we commonly treat include asthma, allergic rhinitis/sinusitis, allergic conjunctivitis, urticaria and angioedema, anaphylaxis, atopic dermatitis, contact dermatitis, food allergies, drug allergies, insect allergies, autoimmune diseases and immunodeficiency. We will try our very best to make your experience in our offices a positive one and properly diagnose and treat your underlying problem. It was a pleasant visit, We had a very intelligent discussion with Dr. Luka and he was very thorough with the requested procedure.